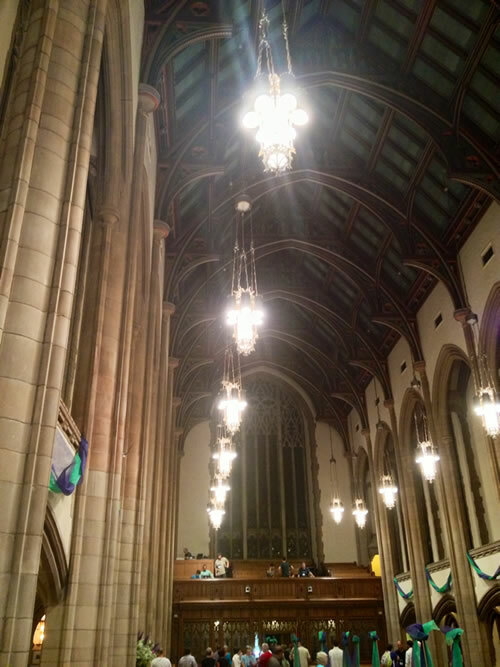 You are here: Home / UMC / The Tent and the Tabernacle: Is worship bettered by permanent space? This scene makes me wonder if the stones really do cry out in our worship spaces in a way that having a permanent worshipping space betters our worship rather than hinders it. Taylor Watson Burton-Edwards‘ recent blog post “Possible Megachurch Trend as a Cue for UM Districts?” asks what could happen if United Methodist mimicked a megachurch multi-site strategy and begin using temporary buildings rather than investing in established churches. In short, multi-site strategies (we call them Walmart churches here at HX) are not to build a buncha churches but to rent space or repurpose space in those neighborhoods so if they change then there’s less cost to relocating closer to where the people are. They just close up their perpetually temporary space and move. And when their location or configuration isn’t positioned to achieve the mission because of any number of changes, the congregation (main campus) re-allocates resources and often relocates meeting facilities to ensure the regional mission can be accomplished as optimally as possible. There’d have to be a whole accountability/decision-making process around it, but I really like the idea of our churches moving from being tabernacles that are stuck in one place to tents that move around and go where the people go. Here’s my pushback: I think this strategy works well for evangelical mega-churches because contemporary worship style doesn’t require a permanent space. Sure, there’s a lot of tech, but the tech can adapt to whatever room they have. The use of screens and a lack of iconography means that a worship service can be set up in an abandoned Wal-Mart or a house just as easily. My claim is that traditional worship needs permanent space to be what it is best at: be a liminal experience of the divine. One of my faults is that I’m a worship space snob. My first church job was a receptionist/wedding facilitator at Wesley UMC in Oklahoma City which has beautiful gothic architecture and cherubim that hold up the lamps in the air. I recently worshipped at Metropolitan UMC in Washington D.C., (see the pic) which was a fantastic experience and I wandered the side areas for a half hour looking at the artwork. Finally, my local church First UMC in Portland, Oregon, has one of the largest pipe organs on the West Coast with high ceilings and glass to a greenspace on one side and stained glass mosaic on the other. None of these churches can pack and move at a moment’s notice and have the same feel or essence to the worship that they have now. I’m not saying contemporary worship is shallow . What I am saying is the traditional worship style with vaulted ceilings, pipe organs filling the space, ancient liturgy connecting with saints of the past…all of that requires a permanent space to be truly liminal. I’m not discounting outdoor worship or traveling revivals…I’m talking about long term ministries that are bettered by a more permanent space. So I like the idea of reducing building maintenance and being able to move where the people are. But at what cost to the experience of the worship style that is amplified by a contemplative space? My personal preference is that I appreciate a permanent traditional space that draws out spiritual exploration moreso than an evangelical worship space that is built to manipulate emotions. The screens, the big speakers, the emotion-laden songs…my spirit doesn’t like to be bashed over the head. My spirit grows when I’m drawn into a stained glass, or when I look at a flying buttress while contemplating a sermon point, or sitting in a pew and I fiddle with the same cracks or warps that people have for 100 years or more. That sense of being a part of something old and traditional and established is just not found in converted Wal-Marts. 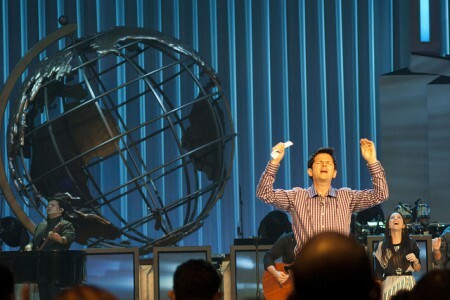 My faith is not dependent on the space…but all other things being equal, my worship is bettered by the space it is in. Do the stones shout? And if they do, can a more missional church also embrace permanent space for worship? Or is tradition the part of our Sources of Authority as United Methodists that we are willing to give up to more easily be where the people are? Your thoughts? Does permanent space better traditional worship–or contemporary worship for that matter? And if so, is having those terrific spaces that may not be as close to the population centers worth the trade-off? I think the text answers your question. It wasn’t in a permanent setting that the event took place. I think what Patrick said before me is quite on, but I offer a slightly different view. I do not disagree with Patrick at all, and my opinion is not contradictory in my opinion. You hit the nail on the head when you said “My personal preference is that I appreciate a permanent traditional space that draws out spiritual exploration moreso than an evangelical worship space that is built to manipulate emotions.” The thing is you hit it on the head in the first 3 words… “my personal preference”. What we need to be careful about when approaching church strategy is that we don’t design for US, but for the world. I am NOT saying get rid of tradition. Let me say that again: I am NOT saying get rid of tradition. What I am saying is that while your preference and emotions say that a traditional space draws out spiritual exploration and that evangelical worship “manipulates emotions”, that is not the case for all. My preference says that the traditional makes me feel out of place, unfamiliar, unable to belong, and trapped while the evangelical makes me feel relaxed, able to follow what is going on (because of the screens and instructions) etc. I am not saying my way is greater than your way. What I AM saying is that there are many people like you, and we (the Christian Church) need to have traditional worship places that they can experience the mystery and reverence of Christ like your UMC locations. There are also people like me, and we (the Christian Church) need to have places of worship where they feel most welcome and at ease and able to experience God. Part of the issue though with dedicated worship space is that you end up spending a great deal of time and money on upkeep of large spaces that you use for only a few hours a week. I have no doubt if I could have dedicated space for each activity in my life that it would be better. I’d love a room just for watching movies in my home. I don’t have that however because it would be incredibly inefficient. So that needs to be part of this conversation too. Gotta say, that has a ring to it. 1) My concern about permanent spaces and all the money we spend on making them inspiring is: Do we become more attached to created things rather than The Creator? Are we storing up treasures on earth where moth and rust destroy and thieves break in and steal? 2) your notion that some worship is designed to “manipulate your emotions” seemed like a generalization. What I have read about is that charismatic and Pentecostal types of worship are growing across the world, many times among the poor. That worship may be perceived differently by some USAmericans like you and me, but I doubt it is manipulating emotions. Rather, there is a real movement of God’s Spirit and power. Now, there may be some churches of which you speak that use the music and tech to try an manipulate emotions, but it’s not all. My optimism wants to think that most are pursuing The Spirit, the presence and power of God. Those are my two initial thoughts. I understand the necessity of being where there people are (and moving with them), but I am concerned about the decision to move on, primarily because it could be seen as “giving up on a location” for whatever reason. How do we determine that an area is no longer in need of our ministry? What kind of legacy (if any) do we leave behind? I like to think that I favor a seeding ministry, where a congregation gets to a certain size and begins the process of seeding a new congregation, determining the location and choosing the leaders from the current congregation who seem most likely to be able to adapt to the changing landscape. I also like to think that this allows for a more relationship-based church, rather than the corporation-church that many denominations seem to currently favor. I tell you, the day is soon coming when you will worship the Lord in neither the tent nor the tabernacle. I’m curious to know what you define as traditional worship. I define it as following the ancient liturgy with traditional music (if any). Having a pipe organ and a vaulted ceiling is nice but is that really what makes it traditional? I’m asking because I spent most of my childhood in very transitory church communities that used fairly plain interfaith chapels. We still held traditional services but we didn’t have any of the physical things you’re including in your description of traditional worship. I love my church. 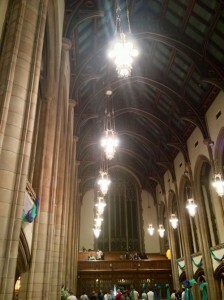 I love the pipe organ and the stained glass. I love knowing that week after week, year after year we’ll be in the same place. Having a church building like that is like having another home. But all of those things have more to do with wealth and history than with worship because at the end of the day, 3 people on a street corner following the liturgy makes a traditional service. I’m with CJ in saying “3 people on a street corner following the liturgy makes a traditional service.” But if I have a choice in where I go, I prefer a traditional service in a traditional worship space, with stained glass and a magnificent organ/ist. It just enhances worship for me. God’s word through the pastor, God’s gifts through the architect & builder, God’s word and gifts through the music. I fully know church is the community of believers worshipping and praising God together. And I get that experience in a 100 year old sanctuary, a home, a classroom, a storefront or a convention center. It isn’t about the setting. But for me, the setting of a 100 year old sanctuary enhances my worship experience and makes me feel closer to God. If a storefront or school or abandoned KMart provides the worship space and modern atmosphere that draws someone to God and church who wouldn’t otherwise come in the doors, that’s the right thing too. It seems many of the new (and successful) church plants fall closer to that category of tent, so they are obviously answering a need that people have to worship in a different way/space.